When you see a stereo rack you evaluate its line, its shape, its strength, its colour, its dimension and also its ability to isolate the components from the external vibrations and from the vibrations that they produce themselves while in use. Before buying a stereo rack you may ask your mate if she’d like to have it in the living room. Maybe you ask for its price, decide if it’s in budget and then buy it. Are there other things to evaluate when buying an audio rack? I don’t know and I don’t think so. Some people say that these racks enhance the characteristics of your devices. Well, if there are gimmicks that modify air molecules and improve your Hi-Fi sound, why the hell a rack shouldn’t do it? I am not going to comment on this, I will not tell you if these Bassocontinuo racks improve the sound of your system because I do not know. Of one thing I am sure: I’d love to have these racks in my room because I like them a lot and they’d give a fashionable look to my place, but their ability to improve or not the performance of my audio system is something I do not want to investigate. Lorenzo Belloli, owner of Bassocontinuo, and his sister - and business partner- Paola, have repeatedly offered me to test their racks but … I am too lazy. I do not want to carry the heavy bulk, put together the rack in my room, set all the components and then undo everything after few days of testing and send it back home. But I am curious, so I took my car and drove to Bergamo to and check if these racks are expensive because they require a lot of work or if it’s just “all sizzle and no steak”, while we love the steak! Let’s rewind the tape a bit … I know Bassocontinuo since their first steps in the Hi-Fi world. They began in a garage and they had no commercial purpose, it was a sort of game. A friend asked them for a rack because he could not find something he liked ... it’s very similar to the story of many start-ups that begin with a “do it yourself activity” that is transformed after a while in a real business. It’s a craftsman activity that grew very fast, faster then they could imagine. The business partner that Lorenzo had at first, quit, and Paola took his place. Now she’s the one that takes care of the suppliers, the bookkeeping and the management of all the work flow. Her brother does the nice (and tiring) part of the job hopping up and down from airplanes and time zones to present all the novelties in Russia, Singapore or elsewhere. I know their racks since always and I also wrote a review of one of them for the audio magazine I worked for some years ago. I remember that I had a hard time to write about the sound and I focused on the stylish side. And I am doing the same here. As for me you can put on it either the urn with your beloved grand dad’s ashes or a very expensive pre amplifier, it is the same. It’s probably the same also for Lorenzo Belloli. He designs and produces the racks and then you use them for your own purposes. I am fiddling about a bit. I know that some of my colleagues will review these racks - or have just reviewed them - and will write about careful listening considering even the least dB. I won’t criticize them for this of course! These racks are having a great success all around the world. The new Aeon has exceeded the selling expectancy by far, and the production of the first Series has been sold 4 times faster than the forecast. Obviously this had a negative fallout on the delivery period, since the production of these shelves needs a manual process that is quite long. Check this out in the video I’ll post below this article. By the way: in the video you’ll see two series of pictures. I shot the first series of pictures that portrays some of the phases of the manufacturing process, the warehouse and other details that I thought were interesting. The second series comes from Bassocontinuo and shows their products placed in different environments all around the world. Bassocontinuo is represented by all the best distributors in many Countries around the world, and as an Italian I am really happy about it. Once again Italian creativity is appreciated as it should worldwide. We could add a small polemic touch by saying that I’d love these objects to be appraised also in our Homeland … but that’s another story. Bassocontinuo is well known all around the world, containers of their stuff are sent in every corner of the planet, but here in Italy they are not so well known. Speaking about the packing boxes, I have shot also the packaging check that has been performed by the manufacturer. The racks travel all around the world, up and down planes and trucks and damages are always possible. Well, the technology of these packaging makes it safe also in critical conditions. A hint to the prices. At a first distracted glance they seem expensive. When you consider all the production phases, the fact that they are not produced on a grand-scale, compared to largely industrialized products, prices couldn’t be different or cheaper. The shelves with a lacquer finishing, for example, must be varnished in a dust free environment to avoid defects and they are polished 12 times on each side to obtain flawless surfaces. I have seen shelves that were not deemed fit even if to me they seemed alright. Only a very expert eye could see the flaws with a certain angle and against the light. 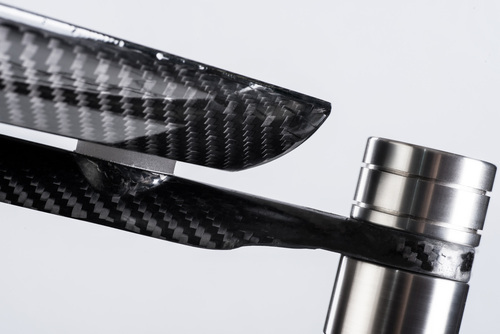 Some details must be completed by hand, the surface of the steel legs or the shelves themselves that, either in varnished wood or carbon fiber, require a final hand polishing. We are talking about about a product that could not be produced with the same quality with an industrial process. To achieve these results it is necessary to employ a craftsman, a very specialized craftsman, one of those artists that makes things an object of desire; that makes you pine for a particular object, rather than a shoddy copy, even if it costs ten times less. The products are customized, so each one can choose the finishing, the color and dimension in an infinite array of possibilities. You can put your Hi-Fi components on the floor if you want, they will play anyway. But if your system is in a dedicated room and not in an industrial setting like mine, and if you want your house to be a nice and elegant place to live in, you’d better choose something different that the usual MDF shelves. Squared, opaque, very likely to chip with the first hit … a very sad furniture that we’d like abolish from every house. If you like the design side and appreciate also the quality of the manufacturing, if you want to invest your money in a product designed to keep the prestige of the brand high and not designed just to make money, you have no alternatives, Bassocontinuo is your only choice, no matter which Series you choose, if the cheapest or the most expensive.